Immunohistochemical Demonstration of Ranavirus Antigen in the Tissues of Infected Frogs (Rana temporaria) with Systemic Haemorrhagic or Cutaneous Ulcerative Disease: Affected frogs can have skin ulceration (ulcerative syndrome) or Systemic haemorrhage (haemorrhagic syndrome) or may be both. Unlike with hemorrhagic syndrome, there was no labelling for viral antigen in the splenic lymphocytes, pancreas or gastrointestinal epithelium with ulcerative syndrome.I/C virus inclusions were seen in the liver, kidney, pancreas and stomach of frogs with systemic haemorrhagic disease, but not in frogs with the ulcerative syndrome. Localization of Fibropapilloma-associated Turtle Herpesvirus in Green Turtles (Chelonia mydas) by In-Situ Hybridization. (J. Comp. Path. 2008, Vol. 139, 218e225). It was found that viral mRNA was demonstrated only in fibropapillomas, but viral DNA was found in both fibropapillomas and fibromas. In fibropapillomas the virus was found replicating in the neoplastic cells which could be identified as intranuclear inclusions. Infestation of Wild-caught American Bullfrogs (Rana catesbeiana) by Multiple Species of Metazoan Parasites Heavy parasitism of wild-caught bullfrogs may confound research protocols and markedly impair animal health. PREVALENCE OF CRYPTOSPORIDIUM INFECTION AND CHARACTERISTICS OF OOCYST SHEDDING IN A BREEDING COLONY OF LEOPARD GECKOS (EUBLEPHARIS ACULARIUS) Journal of Zoo and Wildlife Medicine 39(4): 600–607, 2008– Cryptosporidium varanii (saurophilis). C. parvum and muris are not thought to cause disease in reptiles. C. serpentis is found in snakes. Small intestine infection is most common in Geckos, leading tolymphoplasmacytic enteritis and hyperplasia. Infection is occasionally associated with atrophic gastritis. February 2007. Granulomatous inflammatory lesions with acid-fast bacilli were generally present in the liver, lung, or spleen. Mycobacterium (provisionally named M. liflandii) recently reported by 2 other groups. Antemortem diagnosis and characterization of nasal intranuclear coccidiosis in Sulawesi tortoises (Indotestudo forsteni ). J Vet Diagn Invest 19:660–667 (2007). Rhinosinusitis is a common clinical syndrome in tortoises, often caused by Mycoplasma agassizii or herpesvirus. This study documents the presence of intranuclear coccidia and Mycoplasma spp. 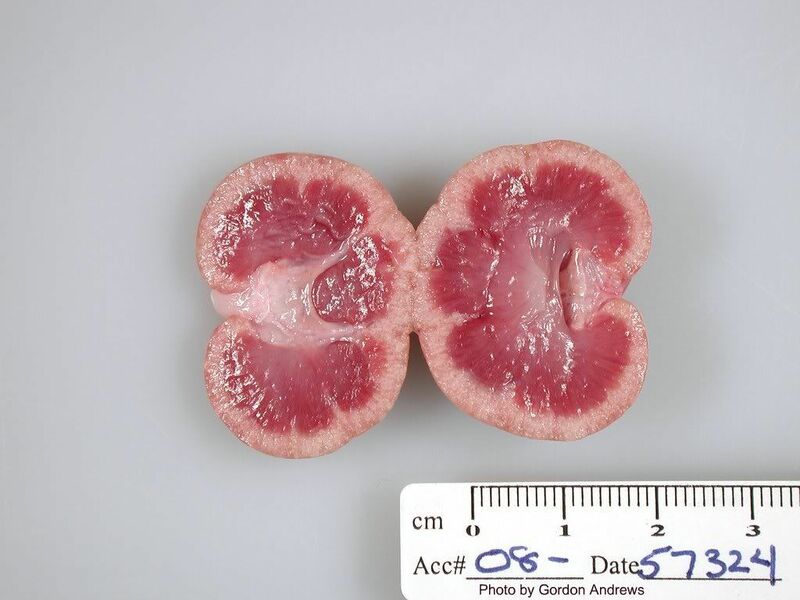 moderate-to-marked hyperplasia of the respiratory epithelium. A lymphoplasmacytic inflammatory response with smaller numbers of granulocytes and macrophages was evident in the submucosa with occasional migration into the overlying epithelial layers. Focal necrosis was noted in the mucosal epithelial layers. Intranuclear coccidian gametes and merontswere detected in the apical respiratory epithelial cells; rarely, oocysts were noted in the surface mucus. Infected nuclei were often enlarged and contained one or more organisms. Trophozoites were 2–5 mm in diameter. Meronts were up to 7 mm in diameter and contained numerous merozoites (Fig. 4). Merozoites were banana shaped, measured 4.0 3 1.5 mm, and budded from a residuum. The merozoites had apicomplexan features characterized by a distinct apical conoid apparatus, numerous rhoptries, and a single central to slightly eccentric nucleus (Fig. 5). Macrogametes and microgametes measured up to 6 mm in diameter. Severe Granulomatous Lesions in Several Organs from Eustrongylides Larvae in a Free-ranging Dice Snake, Natrix tessellate. Vet Pathol 44:103–105 (2007). Nematode larvae surrounded by a capsule, forming a parasitic granuloma with 3 layers: macrophage layer, lymphocyte layer, and fibrous capsule. Differences between newly formed and mature granulomas consisted mainly in the eosinophilic infiltration. subcutaneous connective tissues, on the serosae of the intestines and liver. Chlamydiae in Free-Ranging and Captive Frogs in Switzerland. Vet Pathol 44:144–150 (2007). Of the frogs collected for the prevalence study, 6 of 238 (2.5%) tested positive. no connection to a mass mortality. Experimental Transmission and Induction of Ranaviral Disease in Western Ornate Box Turtles (Terrapene ornata ornata) and Red-Eared Sliders (Trachemys scripta elegans). Vet Pathol 44:285–297 (2007). Consistent histologic lesions were observed only in IM-inoculated turtles and included fibrinoidvasculitis centered on splenic ellipsoids, multifocal hepatic necrosis, and multicentric fibrin thrombi in a variety of locations, including hepatic sinusoids, glomerular capillary loops, and pulmonary capillaries. Virions compatible with Ranavirus (Iridoviridae) were observed within necrotic cells of the spleen of 1 IM-inoculated turtle using transmission electron microscopy. This study fulfills Koch’s postulates, confirming a causal relationship between BSTRV and the clinical and histologic changes in chelonians infected with this virus. Spinal Arthropathy Associated with Ochrobactrum anthropi in Free-ranging Cane Toads (Chaunus [Bufo] marinus) in Australia Vet Path 2008 Jan: Lesions consisted primarily ofventral proliferation of bone and cartilage that resulted in ankylosis and histologically there was pyogranulomatous inflammation. Ochrobactrum anthropi was isolated in 7 out of 9 toads.Cane toadswere introduced into coastal Queensland, Australia, from Hawaii in 1936 in a strategy to control the sugar cane beetle. Characterization of a Biphasic Neoplasm in a Madagascar Tree Boa Vet Path 2008 Mar: Disseminated biphasic neoplasm in a young Madagascar tree boa present composed of discrete neoplastic cells (pulmonary capillaries and hepatic sinusoids) represented the leukemic phase and spindloid cells represented the sarcomatous phase (hepatic and fat body nodules). A zone of transition of the neoplastic cells, from discrete to spindloid, was noted along the periphery of the hepatic and fat body nodules. Ultrastructural examination elucidated similar nuclear features in the discrete and spindloid neoplastic cells and revealed collagen fibers within the spindloid neoplastic cells. 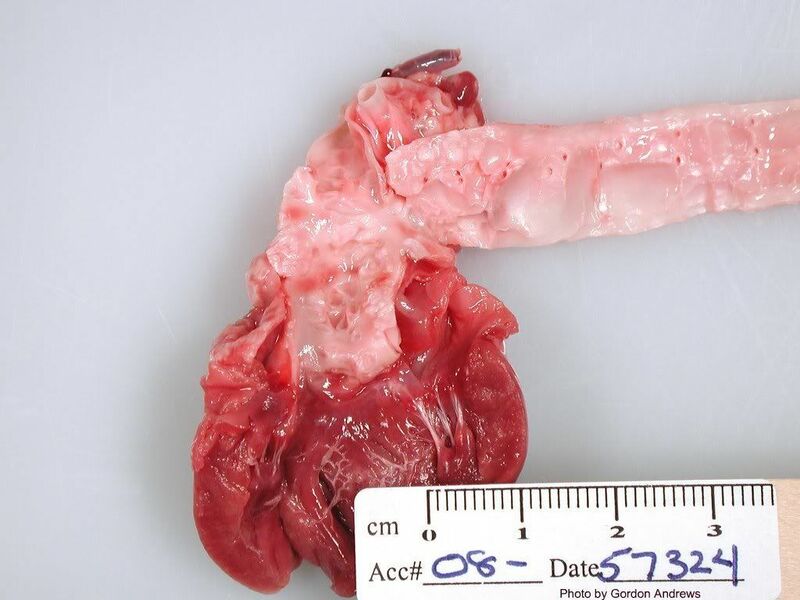 Oviduct Adenocarcinoma in Some Species of Captive Snakes. Vet Pathol 45:693–697 (2008). Microscopically, neoplasms were papillary, and often extended transmurally. The neoplastic cells were polygonal and organized in acini or cords, with often abundant fibrovascular stroma. Hemorrhages and necrosis were present in all cases. Inflammation, myxomatous material, desmoplasia, and bacteria were often observed. 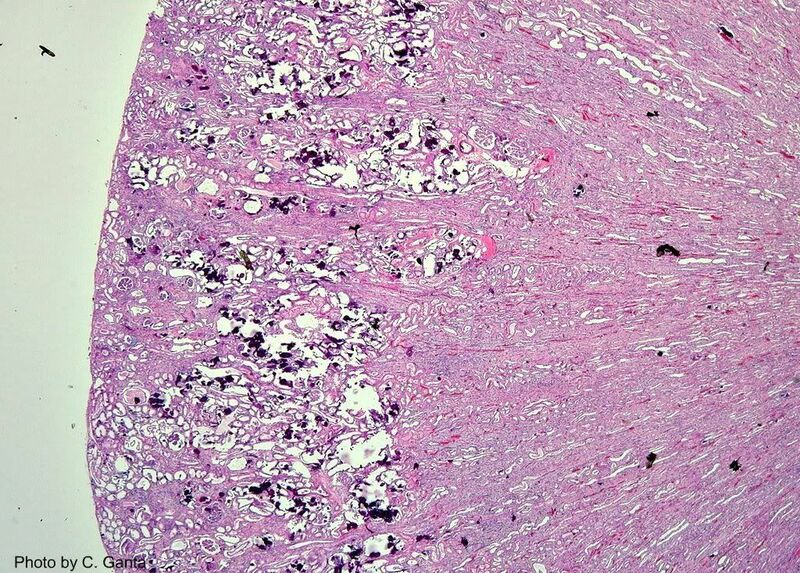 Histologic evidence of metastasis was present in all cases. Metastatic fibrosarcoma in a captive Saharan horned viper (Cerastes cerastes) with high hepatic levels of cadmium. Veterinary Record (2009) 164, 690-692. Cadmium is carcinogenic, no viruses were found in the tumors. Systemic Adenovirus Infection in Bearded Dragons (Pogona vitticeps): Histological, Ultrastructural and Molecular Findings J. Comp. Path. 2009, Vol. 141, 78-83 : non-suppurative hepatitis and interstitial nephritis. Systemic adenovirus infection in Sulawesi tortoises (Indotestudo forsteni ) caused by a novel siadenovirus. J Vet Diagn Invest 21:415–426 (2009). A novel siadenovirus was identified in the Sulawesi tortoise. mucosal ulcerations and palatine erosions of the oral cavity, nasal and ocular discharge. Histopathologic examination revealed systemic inflammation and necrosis associated with intranuclear inclusions consistent with a systemic viral infection. This finding extends the known reptilian adenoviruses to the chelonians and extends the known genera of reptilian Adenoviridae beyond Atadenovirus to include the genus Siadenovirus. 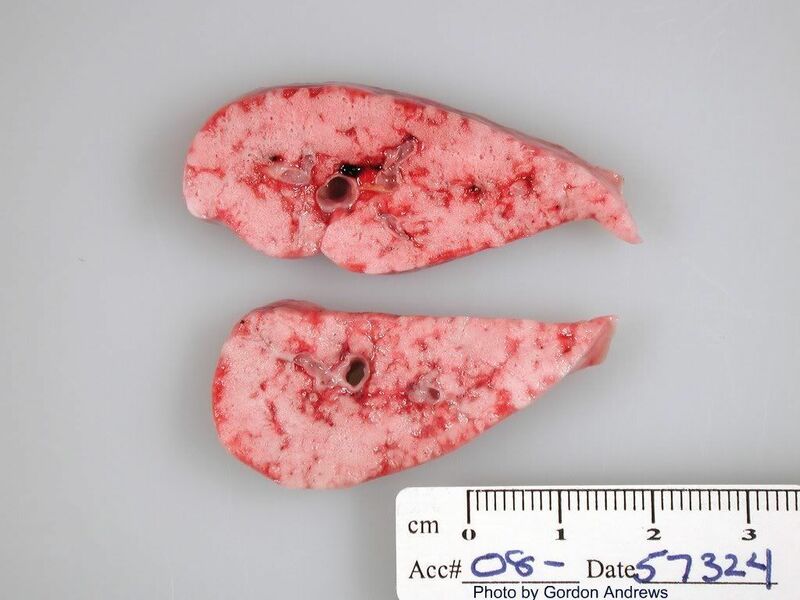 Intranuclear inclusions were found in most of the organs examined, including the bone marrow. The adenoviral inclusions were endotheliotropic and epitheliotropic, as well as myelotropic. – most common coccidia of chelonians: Eimeria spp. Rhabditid nematode–associated ophthalmitis and meningoencephalomyelitis in captive Asian horned frogs (Megophrys montana). J Vet Diagn Invest 21:568–573 (2009). Gross and histologic findings included varying degrees of ulcerative keratitis, histiocytic uveitis and retinitis, meningoencephalomyelitis, and epidermal chromatophore (iridophore) hyperplasia with intralesional nematodes. Caenorhabditis elegans. Primary Osteoma cutis in a European Pond Turtle: JAVMA 2009: Pedunculated symmetric mass from the epidermis. Contained highly sclerotic lamellar bone with hematopoeietic elements. Renal Myxozoanosis in Crowned River Turtles Hardella thurjii: Description of the Putative Agent Myxidium hardella n. sp. by Histopathology, Electron Microscopy, and DNA Sequencing: Histologically, renal intratubular myxozoan spores were associated with renal tubular necrosis, tubular mineralization, and chronic interstitial nephritis, withmembranoproliferative and mesangioproliferative glomerulopathy. Both turtles also had disseminated metastatic mineralization. Myxozoa have recently been reclassified from protozoan to metazoan organisms. Almost all representatives of this phylum are parasites of fish. Gastric Neuroendocrine Carcinomas in Bearded Dragons (Pogona vitticeps). Vet Pathol 46:1109–1116 (2009). gastric neuroendocrine carcinomas, which readily metastasize. immunolabeling for somatostatin was consistently observed in all neoplasms, a diagnosis of somatostatinoma was made. In humans, pancreatic somatostatinomas are associated with a syndrome of hypersomatostatinemia, which includes hyperglycemia, weight loss, and anemia, as observed in some of these bearded dragons. Somatostatinomas in humans are commonly associated with neurofibromatosis type 1 (Von Recklinghausen’s disease), caused by a mutation in the tumor suppressor gene NF1.